Oh yeah. I mean, look at his face and realize that he felt honored and embarrassed at the same time. I wonder if BJ has experienced that kind of feeling before!! They gave him a harp?! Wow! That's an expensive gift. By the way, I love Billie's caption about his trip to Viggiano. It's so heartfelt. 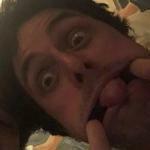 Billie Joe Armstrong , leader of Green Day , has crowned his dream: to visit Viggiano to discover its origins , as the great-great- grandparents born in Viggiano emigrated to the States. There were 3 intense days for the 46 year old welcomed by the mayor Amedeo Cicala , by the fans and by the community. Coming from Cannes, he landed in Naples on Thursday and in the evening, accompanied by his wife Adrienne Nesser and a couple of friends, he reached Viggiano. He visited the country and the home of the great-great-grandparents , Pietro Marsicano and Teresa Nigro , born in Viggiano in 1831 and 1833, then emigrated to California , to Bergeley, in 1868. Armstrong embraced the descendants of the Marsicano and Nigro family in the ancestral home. Right here, in English, he wrote a message , translated as follows: " I have no words to express how grateful I am for the hospitality that Viggiano has for my family. Viggiano is a family . With Love ". These days, accompanied by the mayor, he visited the country and has entertained in some bars and commercial activities, "protected" by bodyguards but also by the great affection of the viggianesi. He tried Lucan food , without escaping hugs and photos. He played the harp of Viggiano, city of music. He visited the Black Madonna and with the guitar he played some notes of " Boulevard of Broken Dreams ". Everything started from an Instagram post by Armstrong, when he published his photo with the Italian flag on his shoulders on February 23, and wrote "I would love to visit Viggiano ". He did not wait for the response of Cicala who officially invited him. Last night he received, during an outdoor ceremony, the honorary citizenship of Viggiano , conferred by the mayor. That is a VERY expensive gift, but honestly if he didn't leave there with a harp somehow, given that he's a musician and that's such a strong part of his heritage, that would be insane. I wonder if he'll learn to play it. That must have been so emotional for him to hear the song he wrote for his father being played in his ancestral home on their traditional instrument. The way it’s played the harp looks very similar to piano just plucking the strings directly instead of hitting them with keys and hammers. I’m sure he could figure it out and play it pretty quickly. He’s gonna have a good time with that harp they gave him. Harp on the next Green Day record? Man, I hope we get a video of him playing the harp. I really wanna see/hear him play. All this makes me really really overwhelmed with happiness. Billie seems overwhelmed too. I'm just crying of happiness because I see he's so happy. He is living something beautiful. And those fans playing him all these songs of his... he must be blown away to see how much his fans love him. I feel him more than ever when he says he feels so much gratitude. It's both ways and that's beautiful. I think it quickly became clear to him that half the town was going on this journey with him, haha. Hopefully he got some time to himself (or with the company he chose) as well. Judging by how quiet today has been by comparison I imagine he did. Yes and I suppose making the city tour public was a part of the deal because it's amazing publicity for the place. But I can't help looking at it feeling like "omg, chill!" These look like they were from today. Still in Italy but not sure where.